What Can You Plant in Dry Shade? 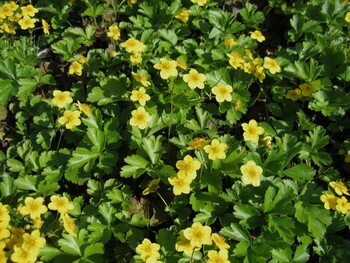 Try some of these lovely and dry-tolerant ground covers and blooming perennials. Most shade plants prefer moist soil, so dry shade is a special challenge for gardeners. Many shade trees have root systems that spread beyond the crown, and their roots are strong competitors for soil nutrients and moisture. You’re most likely to find dry shade under trees with wide-spreading, shallow roots, such as Norway maple, beech, and willow, and, of course, evergreen trees. So what can you plant in dry shade? The following plants will perk up a dry, shady spot in your garden – which is not to say that they prefer dryness, just that they’ll do better in dryer conditions than other shade plants. I find that small-sized plants sold in four-inch pots are easier to tuck in between tree roots than larger ones. The smaller the planting holes, the less you have to chop away at roots. Be sure to water your new plants well in the first couple of months while they’re getting established. After that, to give your plants the best possible chance in dry shade conditions, continue to water deeply and fertilize them once a month throughout the growing season. If these plants don’t work, or you want to do the least amount of work possible, you can just take the path of least resistance and put a layer of mulch under your trees. Big-root geranium (Geranium macrorrhizum): Attractive and aromatic leaves, flowers in late spring in colors ranging from white to pink and magenta, depending on cultivar. Not to be confused with the common annual geraniums of the genus Pelargonium. Bishop’s hat, or barrenwort (Epimedium x versicolor ): Attractive heart-shaped leaves. With its delicate yellow flowers, ‘Sulphureum’ is the most popular cultivar. Heart-leaved bergenia (Bergenia cordifolia): Large, leathery leaves and rose-pink flowers in early spring-looks great in a big grouping. 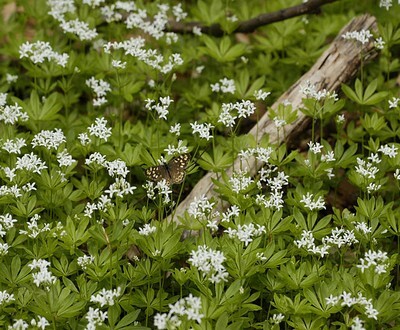 Sweet woodruff (Gallium odoratum): Finely textured leaves and white flowers in spring; excellent ground cover in dry shade. Small but very fragrant flowers; eager to spread in most garden conditions including dry or moist shade. To make it really easy, consider the big three ground covers – English ivy, pachysandra, and periwinkle – which are all tough evergreen perennial plants. 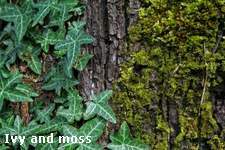 However, be cautious with the ivy, as it has become invasive in some regions. Garden writer Yvonne Cunnington is the author of a book for beginner gardeners called Clueless in the Garden: A Guide for the Horticulturally Helpless. For more information about shade gardening, see Shade Gardening by Yvonne Cunnington.